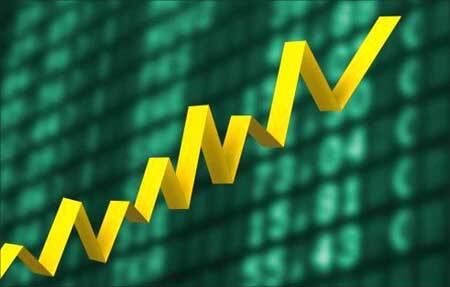 On January 8, 2008, history was made as the Bombay Stock Exchange's Sensitive Index (Sensex) hit the magic 21,000-mark! Just about 18 years ago on July 25, 1990, the Sensex touched the magical four-digit figure for the first time and closed at 1,001 in the wake of a good monsoon and excellent corporate results. But within two weeks of touching 21,000 the fairy tale ended, and on January 21, 2008 the Sensex registered the first-ever four digit loss when it plunged 1,408 points to close the day at 17,605. Since then the slide was steeper till it almost plunged below 7,000. At its peak in October 2007, global equity, or the market capitalisation of all companies in world stock markets, stood at $62.5 trillion, close to that year's world GDP figure of $65 trillion. Then the American sub-prime crisis hit the shores, banks collapsed and financial institutions went belly-up. A jaw-dropping $37 trillion of wealth in the form of market cap was wiped out in 18 months up to the multi-year lows that were reached on March 9, 2009. That was 59 per cent of public company values, or $25.5 trillion. Since then, however, equity values have risen 37 per cent - a wealth-growth of $9.5 trillion - to just over $37 trillion. Almost all markets fell in 2008. According to a report by EconomyWatch, 62 markets out of the 83 studied are now up. The Bolsa de Valores de Lima, the stock exchange of Peru has several indices. The IGBVL (Indice General Bolsa de Valores) is a value-weighted index that tracks the performance of the largest and most actively traded stocks on the Lima exchange. Peru's economy has shown strong growth over the past seven years, averaging 6.8 per cent a year, helped by market-oriented economic reforms and privatisations in the 1990s. Its GDP grew 9.8 per cent in 2008 to $127.8 billion. 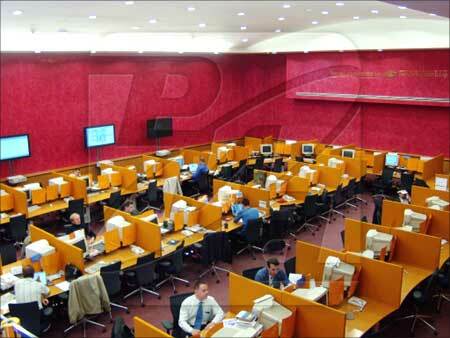 Image: The stock exchange of Lima, Peru. The Moscow Interbank Currency Exchange or MICEX is one of the largest universal stock exchanges in the Russian Federation and East Europe. MICEX opened in 1992 and is the leading Russian stock exchange, consisting of shares and corporate bonds of about 600 Russian companies. After a massive sell-off last year pushed the valuations of Russian companies to record lows, rising energy prices in recent months have drawn investors back into the market. In May 2009, the Micex index of major Russian company shares, was up about 105 per cent after bottoming out on October 27. Russia's economy shrank by 7 percent year on year in the first quarter of 2009. Unemployment was up, at 8.5 per cent in February, the highest level since January 2005. Image: Moscow Interbank Currency Exchange. Bombay Stock Exchange, Asia's oldest bourse, is 133 years old and had a market capitalisation of $1.79 trillion (December 31, 2007). BSE is the world's number 1 exchange in terms of the number of listed companies and the world's 5th in transaction numbers. Braving the global recessionary trends, India managed 6.7 per cent economic growth in 2008-09 despite the manufacturing sector recording a dismal performance. A 5.8 per cent growth rate during the last quarter of the fiscal, at a time when most developed economies have shrunk, puts India among the top-most growing nations. Inflation slipped to 0.13 per cent, the lowest ever in over three decades even as prices of essential food items turned dearer. 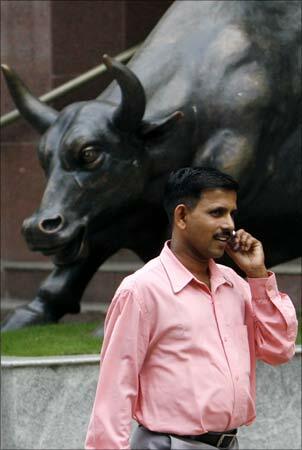 Image: A man speaks on a phone in front of a bronze replica of a bull at the gates of Bombay Stock Exchange. China's 2009 real GDP is seen to grow by just 6.5 per cent. Growth will recover in 2010, but only to 7.3 per cent. The economy will be supported by a rapid expansion of government infrastructure spending and policies to revive housing investment. The outlook for exports is poor, but falling commodity prices will also depress imports. 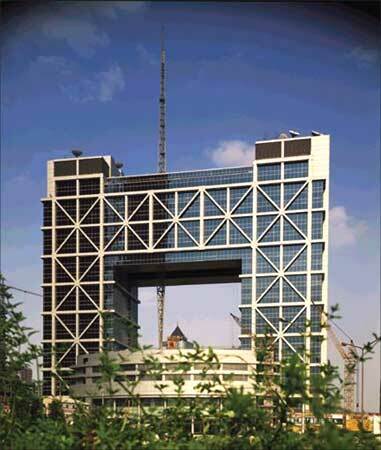 Image: The Shanghai stock exchange. Established in 1962, the Taiwan Stock Exchange Corporation is located in Taipei 101. It began operating as a stock exchange on February 9 1962. In 2009, Taiwan is likely to witness a negative GDP growth of -6.5 per cent, and this will be followed by only a very modest recovery in 2010, as both domestic and external demand are set to remain weak next year. Consumer price inflation averaged 3.5 per cent in 2008 as high global oil and non-oil commodity prices continued to push up producer prices. Image: The Taiwan stock exchange in Taipei. The PFTS Stock Exchange is the larger of Ukraine's two main stock exchanges (the other being the Ukrainian Stock Exchange). Approximately 220 companies are listed on the PFTS, which began operation since 1996. The global downturn is hammering the export-oriented Soviet-era steel and chemical industries that account for 30 per cent of Ukraine's gross domestic product. Its financial system is in chaos and, is facing imminent default. The bank accounts of millions of Ukrainians have been frozen, unemployment is spiralling, the hryvna (Ukrainian currency) has lost half its value since last summer, and the price the country has to pay for its main energy source, Russian gas, has just doubled. The World Bank recently warned that Ukraine's economy will shrink nine percent in 2009 amid the global economic crisis. 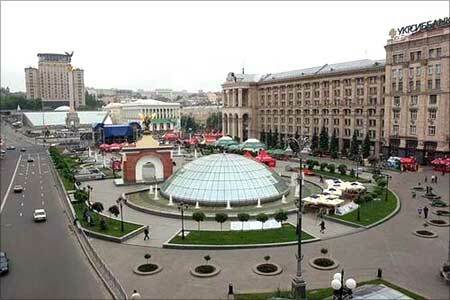 Image: Central city of Kiev, Ukraine. 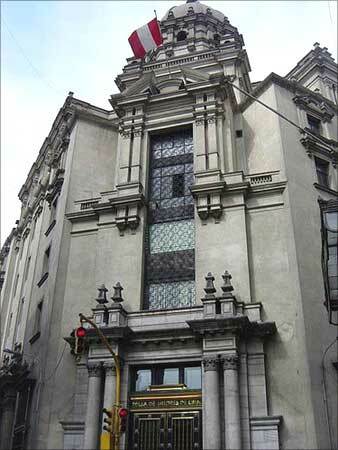 The Buenos Aires Stock Exchange founded in 1854, is the successor of the Banco Mercantil. Argentina's economy has sustained a robust recovery following the severe 2001/2002 economic crisis. Its GDP stood at $261 billion in 2007. President Cristina Fernandez recently said Argentina's economy will grow again in 2009, refuting private forecasts for a contraction. 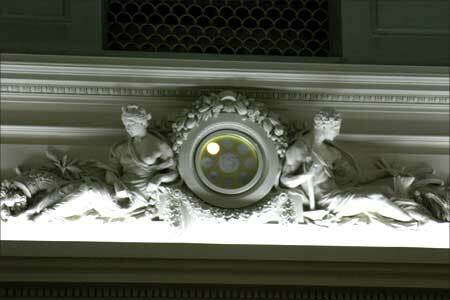 Image: Buenos Aires Stock Exchange. Bursa Efek Indonesia was previously known as Jakarta Stock Exchange. Its name changed in 2007 after it merged with Surabaya Stock Exchange. As of December 31, 2007, the Indonesia Stock Exchange had 383 listed companies with a combined market capitalisation of about $212 billion. Indonesia, a vast polyglot nation, struggles with persistent poverty and unemployment, inadequate infrastructure, pervasive corruption, a fragile banking sector, a poor investment climate, and unequal resource distribution among regions. In 2007, its GDP (purchasing power parity) stood at $845.6 billion. 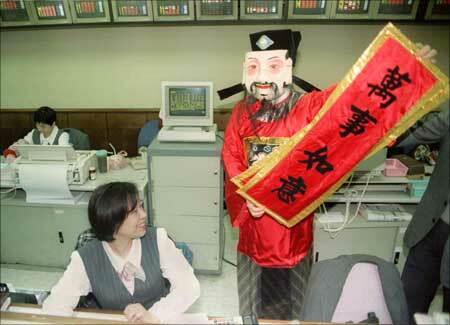 Image: A dealer at the Jakarta Stock Exchange celebrates the end of the final trading session. The Tel Aviv Stock Exchange, colloquially known as the Boursa is Israel's only stock exchange. The TASE is the only public market for trading securities in Israel. The precursor to the TASE was the Exchange Bureau for Securities, founded by the Anglo-Palestine Bank (which became Bank Leumi) in 1935. The economy of Israel is a diversified market economy with substantial state ownership and a rapidly developing high-tech sector. The country's GDP (p) in 2006 reached $195 billion according to the International Monetary Fund. 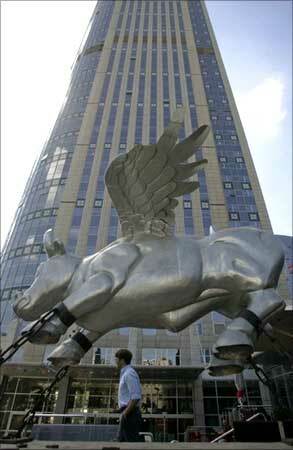 Image: The bull in front of the Tel Aviv Stock Exchange. Bolsa de Valores, Mercadorias & Futuros de Sao Paulo the Sao Paulo-based stock exchange is the fourth largest bourse in The Americas in terms of market capitalisation, behind NYSE, Nasdaq, and the Toronto Stock Exchange. It is also the thirteenth largest in the world in terms of market capitalisation. On May 8, 2008, the Sao Paulo Stock Exchange (Bovespa) and the Brazilian Mercantile and Futures Exchange merged, creating the new BM&F Bovespa. Four-fifty companies traded at Bovespa as of April 30, 2008. Brazil's economy outweighs that of all other South American countries and is expanding its presence in world markets. In 2007, its GDP (purchasing power parity) stood at $1.838 trillion. However, in 2009 it has slipped into recession as its economy contracted by 0.8 per cent in the first three months. 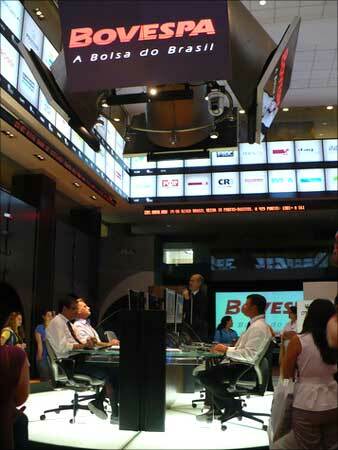 Image: The Sao Paulo Stock Exchange (Bovespa).